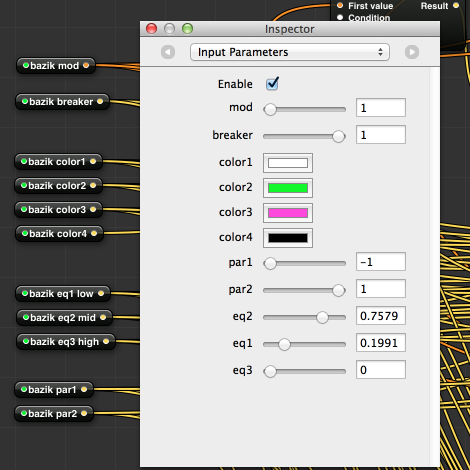 Quartz Composer is a node-based visual programming language for processing and rendering graphical data. Many vjs and video creators use this language to create animations. Compositions created in Quartz Composer can be played in Bazik as a preset. If the composition is intended for, you can use Bazik controls to play with (parameters, colors, sound analysis). Where find Quartz composition ? You can find « Bazik ready » Quartz compositions in our blog : http://bazik-vj.com/category/free-contents/. You can find Quartz composition easy on the web but this files are not create specially for Bazik. That’s why it’s better to create your own composition. How to add a Quartz composition ? Simply drag and drop them in the Presets panel. Bazik transform instantly your Quartz composition in a preset. If a file allready exist with the same name, this file would be update. How to delete a Quartz composition from Bazik ? How to create Quartz composition for Bazik with full control ?